Tuljapur is popular pilgrimage town in the state of Maharashtra, India. The town is situated in the district of Osmanabad of the state. It was earlier known as Chinchpur, the land of tamarind trees as it literally means. The major attraction of the town is it’s a temple of Tulja Bhavani. Tulja Bhavani is a form of goddess Durga and it was the main deity of Bhosale clan of Maratha Kingdom. The great Maratha King Chhatrapati Shivaji Maharaj (who belonged to Bhosale clan) also revered the goddess Tulja Bhavani the most. 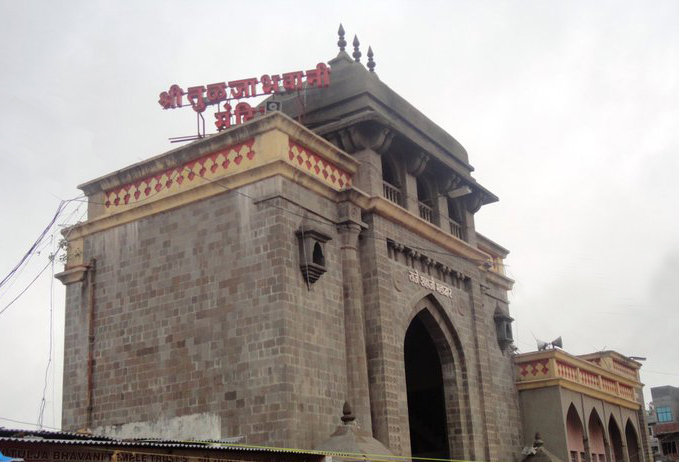 The holy town of Tuljapur has derived its name from the Tulja Bhavani temple. On the occasion of Navaratri the temple take upon a fascinating look as it is beautifully illuminated. Thousands of devotees from far and wide throng there to seek blessing from the Goddess. It also attracts devotees from nearby states like Karnataka and Andhra Pradesh. Bharti Buwa’s Mutt, Chintamani, Ghat Shila temple, Saint Garibanath Mutt and Vishnu Tirth are other important religious places to be seen in and around Tuljapur. Akkalkot and temple town of Pandharpur are other nearby places of worship you can visit on your trip to Tuljapur. Solapur city is just 45 km away from Tuljapur and serves as the nearest railhead to it. Solapur railway station is well connected to other cities and towns of the state and the country. Many state run buses and cars are available to reach here from Solapur, Aurangabad, Pune, Nagpur, Mumbai and other many cities and towns of the Maharashtra and other nearby state of Hyderabad and Karnataka. Chikalthana airport at Aurangabad is closest airbase to Tuljapur. The airport is linked by regular flights to Mumbai.